Ian Spielman of the Joint Quantum Institute proposed a novel experimental protocol whereby neutral atoms in a Bose-Einstein condensate would behave like charged particles in a magnetic field. 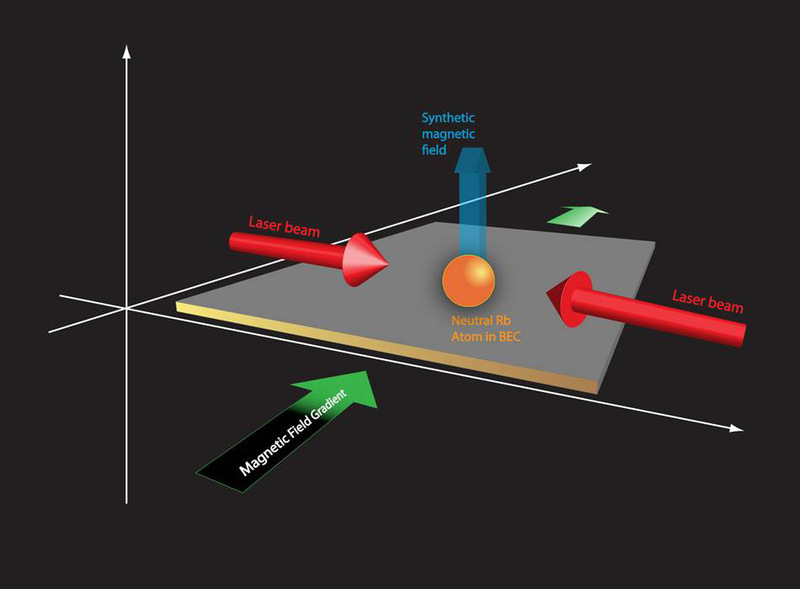 Physicists can use such an arrangement to create precisely tunable models to study the dynamics of electrons in a solid-state lattice as well as to explore new physics of “synthetic magnetism.” To place the neutral atoms in a synthetic magnetic field, the protocol requires simultaneous action of two principal components: a weak gradient magnetic field and a pair of counter-propagating laser beams. The bias magnetic field splits the atoms’ energy levels and a small gradient from the beams on top of that makes the splitting position-dependent. The combination of those two components, Spielman theorized, should produce a synthetic field that interacts with the atoms as if they were charged particles experiencing a Lorentz force. This arrangement was subsequently tested by experiments with rubidium atoms, and the results demonstrated that the basic elements of the protocol work. Among many possible options, researchers may employ such effective fields to learn how to manipulate exotic states of matter for eventual use in topological quantum computation.